We’d love your help. Let us know what’s wrong with this preview of Marcello & Grace by Marianne Knightly. When fate made Lady Grace a widow, after years of a disastrous, abusive marriage, she felt a sense of relief and escape. Now, a year after her husband’s death, she’s just beginning to feel like her old self again, though she still carries the scars, both visible and hidden, of her past. Having been separated from friends and family for too long, she’s only too happy to see When fate made Lady Grace a widow, after years of a disastrous, abusive marriage, she felt a sense of relief and escape. Now, a year after her husband’s death, she’s just beginning to feel like her old self again, though she still carries the scars, both visible and hidden, of her past. Having been separated from friends and family for too long, she’s only too happy to see her old friend, Princess Catharine, on a visit to England. What she didn’t expect was a visit from her brother, Prince Marcello. When she begins to feel the first stirrings of love within her, can she overcome the horrors of her past to make a future with him? To ask other readers questions about Marcello & Grace, please sign up. What a wonderful couple. They compliment each other well. Grace needs someone she can feel safe and valued with. Maricello needs someone to love him and need him alone. I appreciated Ms. Knightlys depiction of Grace. Life after abuse is not easy. In some ways it maybe be harder because it is internalized and while the abuse itself isn't happening, the nightmares and self-doubt continues. Because of this difficult subject matter, I highly this story to only recommend 18+. Grace's story was just so moving. I felt her pain as if it were my own. And Marcelo is the sweetest hero I've ever read. He was just so caring and patient. Like the first book in this series, I enjoyed the concept but some parts fell a bit flat for me. Unlike book 1, this novel was a bit of insta-love which tends to annoy me. 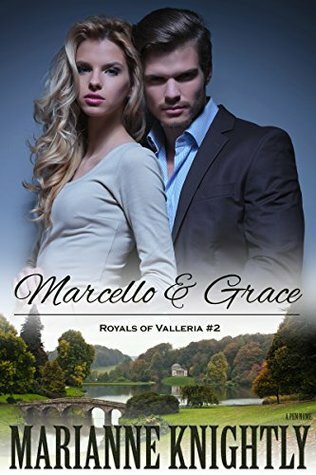 This story is set up at the end of book 1, and Marcello is fascinated by Grace before he even meets her. This didn't quite ring true to me, since the only thing Catherine really told him was that Grace's husband had died. I was also a bit surprised that the relationship progressed as quickly as it did given her history and ove Like the first book in this series, I enjoyed the concept but some parts fell a bit flat for me. Unlike book 1, this novel was a bit of insta-love which tends to annoy me. This story is set up at the end of book 1, and Marcello is fascinated by Grace before he even meets her. This didn't quite ring true to me, since the only thing Catherine really told him was that Grace's husband had died. I was also a bit surprised that the relationship progressed as quickly as it did given her history and overall distrust of men. The main suspense part of this book also seemed a bit anti-climactic to me. Lady Grace was abused by her husband. She has found relief after he died. Princess Catherine has come to England to visit her. Her brother Marcello has come to visit too. Marcello has been drawn to her picture since his sister talked about going to see her. Some drama, love scenes were x-rated, wanted more detail about secret mission. Nice plot. For how traumatized the heroine was, it was unbelievable how quickly she got physical with the hero. And then to refuse commitment but want to be together forever? Immature, selfish, and stupid. Let's shack up in the castle! It is well written and a joy to read. The story flows from the previous book in the series. Good use of characters. I really liked it. It was easy to read and the characters have a lot of depth to them. Nice plot.